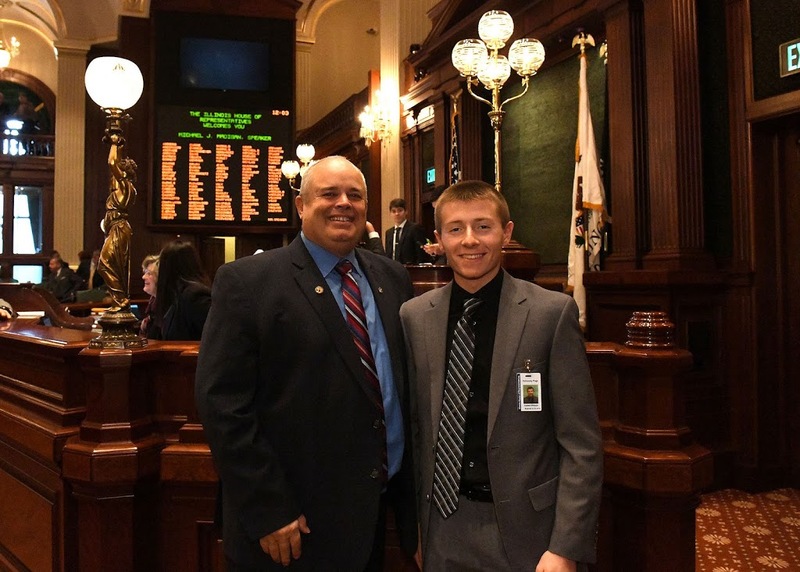 State Representative Dan Swanson hosted Galesburg resident Caden Wilson as an Honorary Page in the Illinois House during the Fall Veto Session on Wednesday, November 28 and Thursday, November 29, 2018. Caden, the son of Major Scott & Heather Wilson, is a Junior at Galesburg High School where he is Captain of the Varsity Soccer Team, on Track, a peer tutor, in Marching Band, Concert Band, Jazz Band, and a German Exchange Program participant. Additionally, Caden is on his church worship team, Knox-Galesburg Symphony, a Junior High Ministry Leader, and is active with the Fellowship of Christian Athletes. He has been recognized as 2016 Varsity Soccer MVP, 2017 Soccer Team Captain, honored as part of the 2017 All-District Orchestra (IMEA), on the German Honor Society and has received Academic Excellence Awards.